Let’s continue on with our Jamboree coverage. 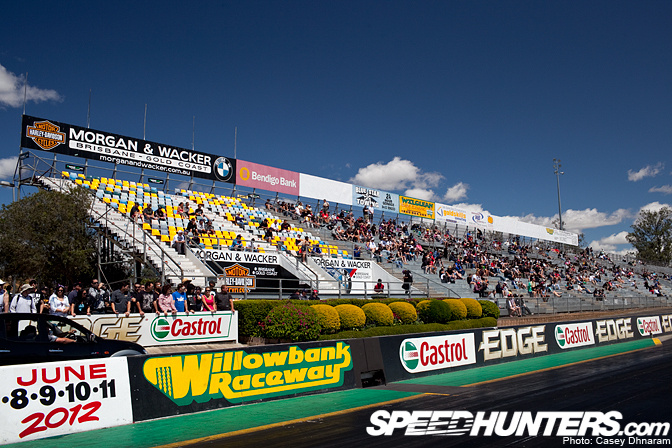 In this part we will be taking a closer look at at all the action on the drag strip. 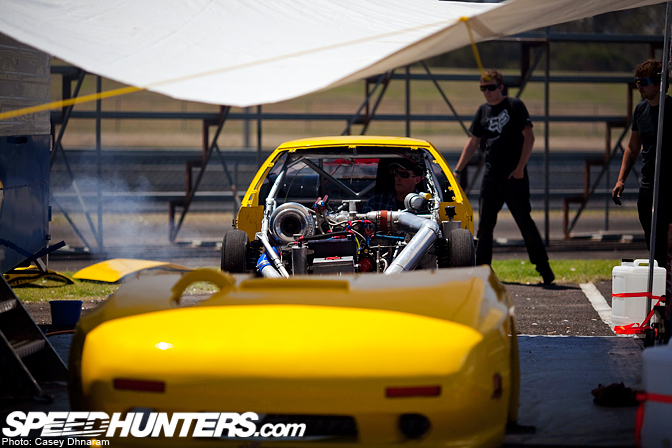 In case you missed Part 1 with all the pit action be sure to check it out here. 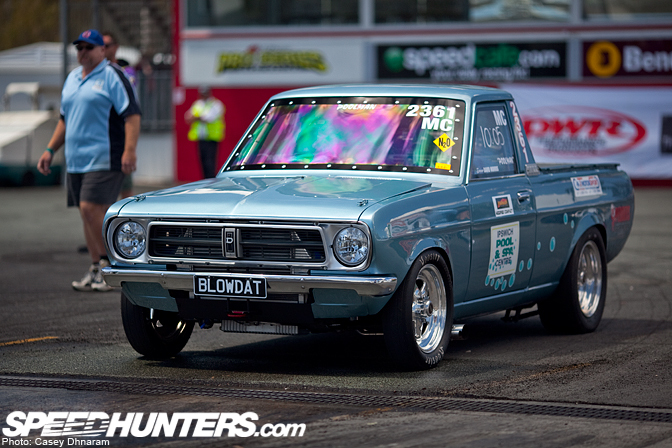 First up we have Ben Bray in the Datsun 1200 coupe getting some heat into the tyres. 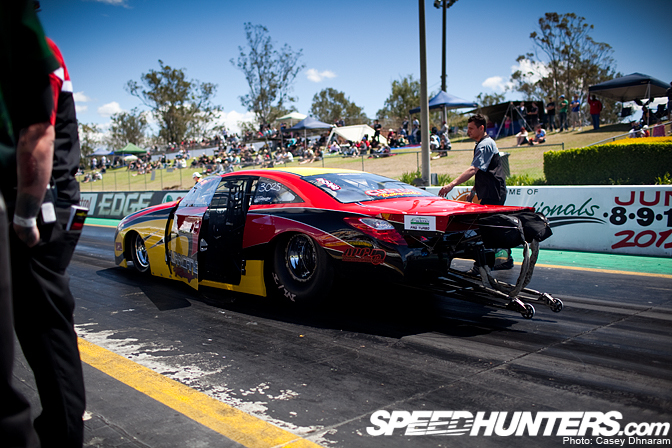 As I mentioned in an earlier post, this is Rod Harvey’s ex-drag car and it’s great that the car hasn’t been retired. 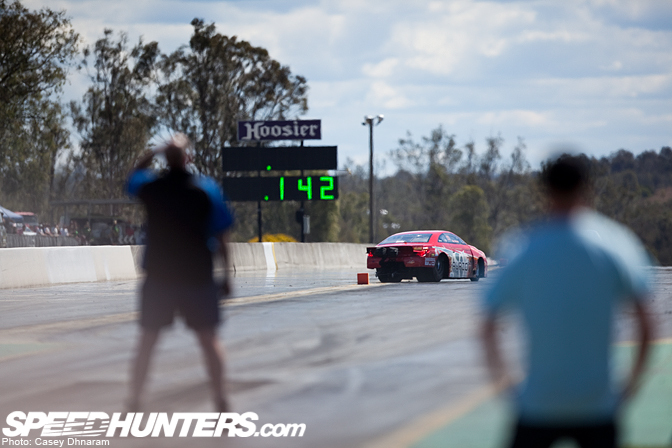 Ben Bray lost his first race against Collin Willshire with a 7.410. 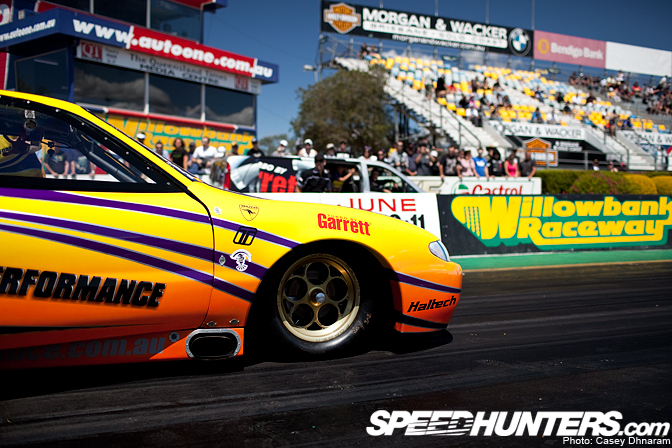 …But of course Rod Harvey’s in the 6 second 2JZ-powered Toyota Celica. 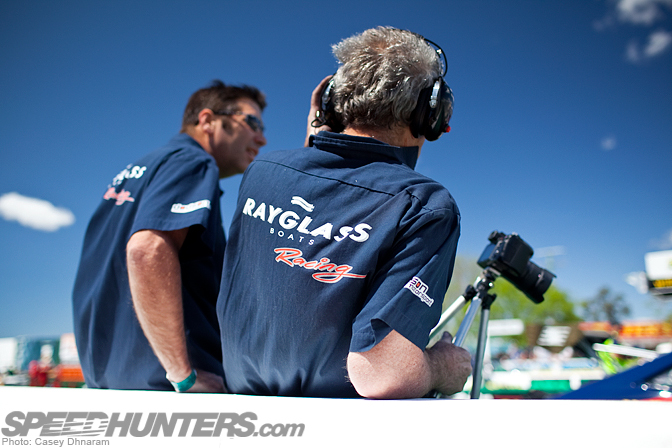 …Rod Harvey in the Rayglass Celica. 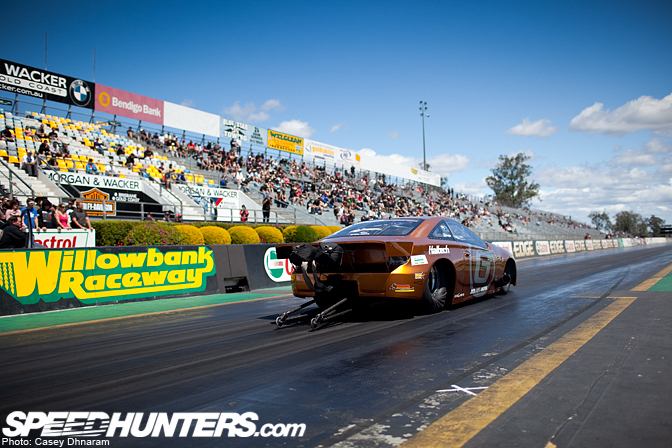 Rod managed to take the win with a 6.542 @ 220.40mph. Due to a music festival the day before and the NRL ruby grand final, the grandstands didn’t seem to be as full as last year’s Jamboree. However, as the day went on the spectators slowly filled up the vacant seats. For the start of the day, this is the vantage point I decided to shoot from. I was standing in front of the officials on the median strip. 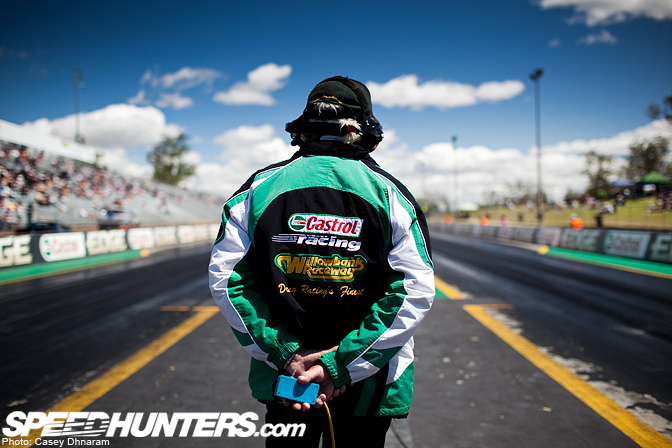 Trying to shoot 2000+HP cars as they go through three gears doing burnouts definitely got the blood pumping! The Pac Performance Mazda 6 loves to shoot some insanely large flames out the side; at one point I was worried it was going to singe my clothes off. …But didn’t have the best of luck down the quarter. When I spoke to Tony he mentioned that over the course of the weekend the track didn’t reach temperatures they were hoping for. 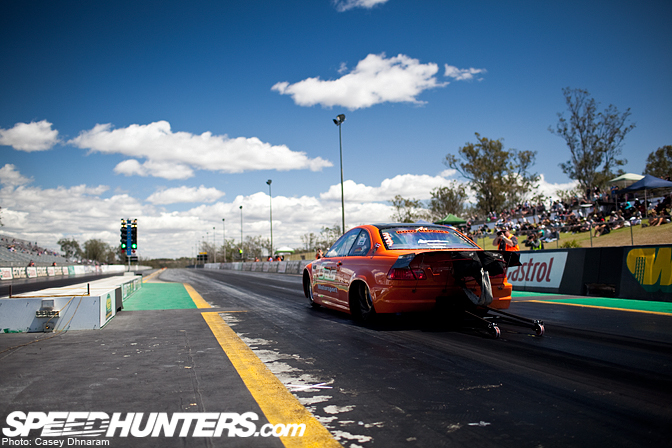 Shane Crichton and his sleeper Toyota Cressida (AKA 1JZ-747) has been around for many years. 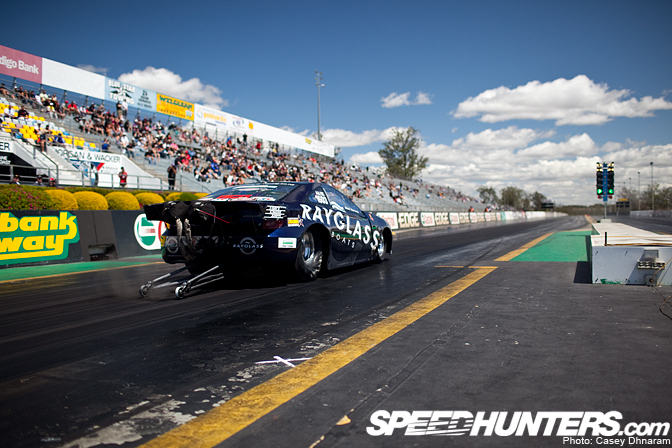 He managed to take the win in Modified 10.5 with a 8.055 second pass at 177mph. The man who controls the Christmas tree. In between classes I made sure to pop into the pits to see what the teams were up to. My ears were deafened by the sound of rotaries. The Pac Performance Mazda 6 looked formidable on-track. In the pits the team were constantly tweaking the 6 before its next pass. 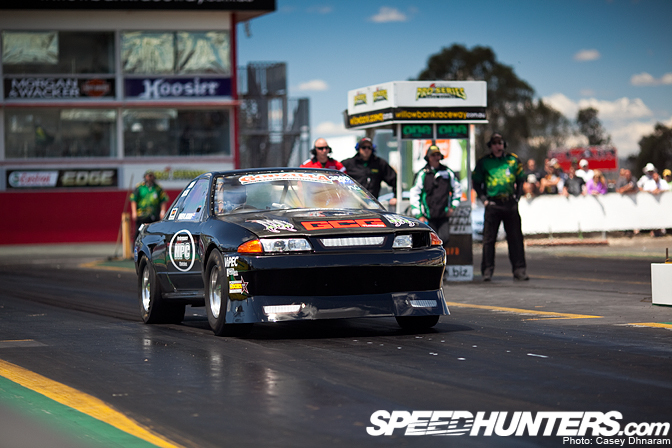 Reece McGregor’s R32 GT-R from New Zealand ran some solid times throughout the morning sessions and seemed to be gripping up nicely off the line. Reece’s PB was a 7.639 @ 183.02mph. I love the amount of variety the lower classes bring to Jamboree. Little Datsuns such as this one may look cute – until you hear them off the line. 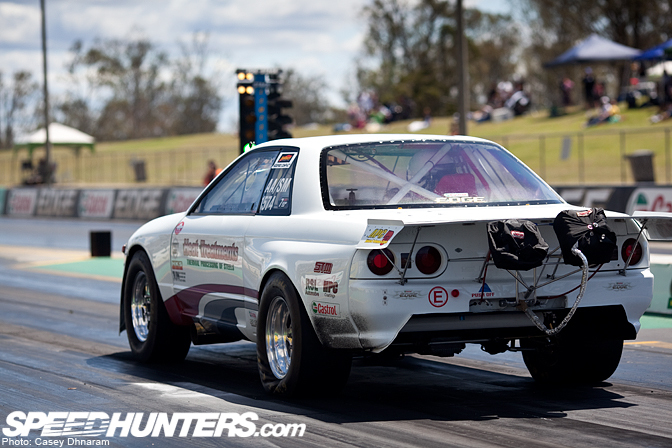 Last year Australian Mark Jacobson was struggling to keep the APC R32 GT-R on its leash. This year the GT-R looked much more behaved. These EVO struggled for traction and almost came into contact with the wall 50-odd metres down. A car that has been attending Jamboree for many years is the purple Millennium Motorsports JZA80 Toyota Supra that has an insane 2JZ. 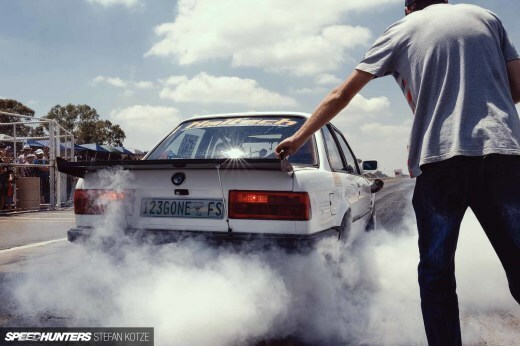 I love snapping photos of this car doing burnouts. 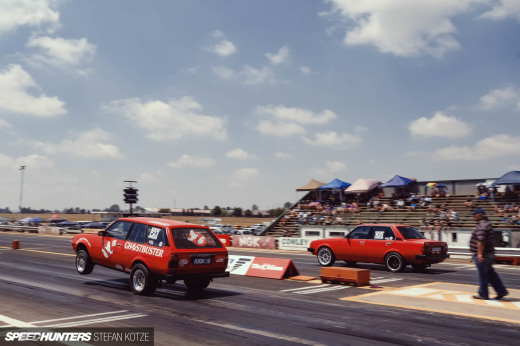 As the afternoon came around cars slowly began to get knocked out and the competition narrowed down to the big guns. 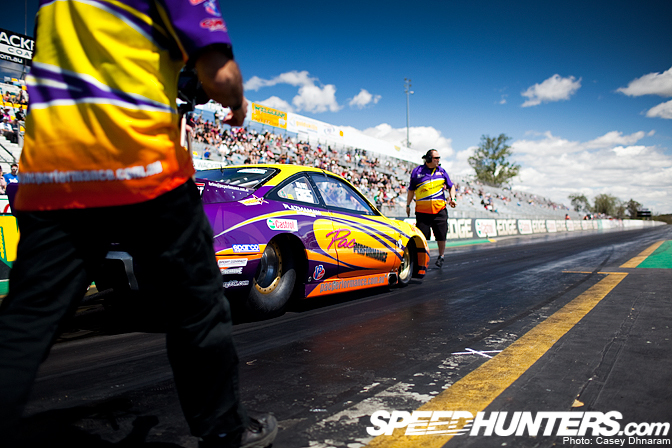 This was one of the last runs for Pac’s Mazda 6 before the finals. When I took this shot, little did I know that a thousand chunks of rubber and pebbles were about to be thrown my way. But hey, it was worth the shot. 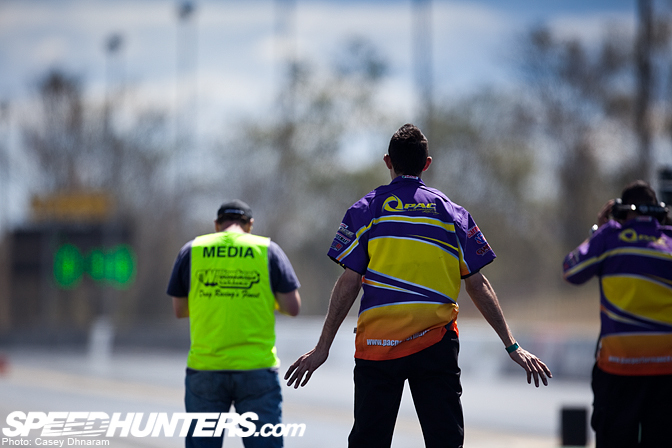 …Causing a confusing instant reaction by the Pac Performance Team. However, in saying that they still managed to win. 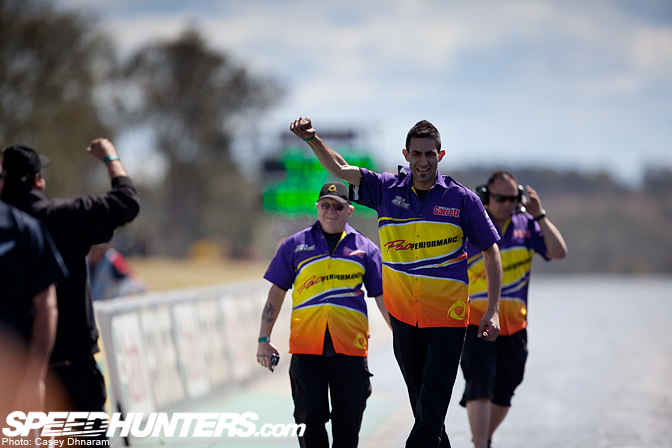 We hope you’ve enjoyed Part 2, keep your eyes peeled for Part 3 as we go straight into the finals. Picture 2 is a 1200 coupe... whats left of it anyways! Great photo's but isn't that PAC's old MX6? 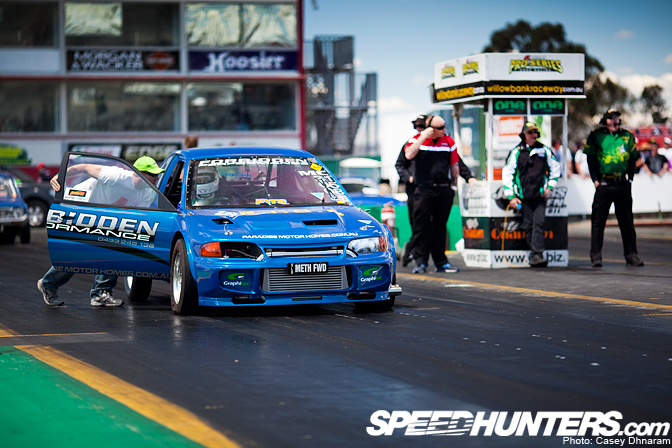 Hey Casey, the black GTR of Mark's is from Godzilla Motorsport not APC and the blue "EVO" is a fwd Lancer! Just to clear things up. Ummm couple of major corrections here.... That is the Pac MX6... there mazda 6 didnt make it this year... also a bigggg mistake.. Mark Jacobson owns Godzilla motorsports.... Definately not an APC car at all!! !